“The Dunckel Home” at 122 Spencer Road, Town of Manheim, Herkimer County, Dolgeville, New York, was built in 1817 and was originally occupied by hired farm hands to run the farm. One of the main crops grown on the farm was hops. Peter Dunckel, the owner of the farm, lived in Dolgeville at 16 Howard Street. Peter was born in Freys Bush, Montgomery County, New York. Peter’s son Everett and his wife Alice Silvernail were married on Christmas Day in 1878 and moved to “The Dunckel Home” on Spencer Street. They continued to work the farm and also employed several hired farm workers. On July 31, 1888 Alice (Silvernail) Dunckel gave birth to their only child, a son, Arthur who became an engineer at Cherry-Burrell of Little Falls, New York. Arthur in 1912 married Ina Slack , a school teacher at Dolgeville, and moved to the “Old Farm”, where they lived for 60 years and raised 4 children. 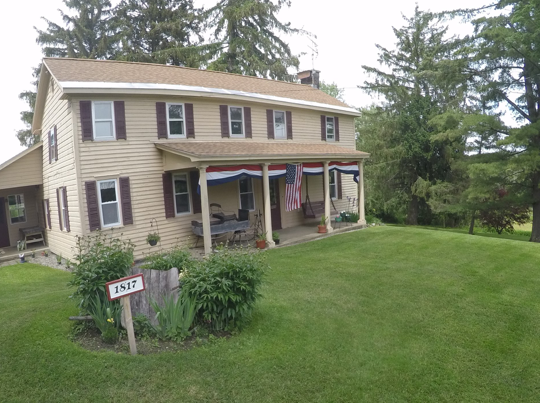 The current owner Steve and Cheryl (Spofford) Trodler purchased “The Dunckel Home” in October of 1972, and history and life on the “Old Farm” continue.